March 2017: South Africa has been named one of sub-Saharan Africa’s entrepreneurial frontrunners, after a global report placed the country in second place, after African counterpart Botswana. 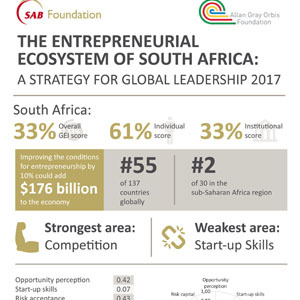 According to the Entrepreneurial Ecosystem of South Africa: A Strategy for Global Leadership Report, researched and produced by the Global Entrepreneurship and Development Institute (GEDI) – a research organisation that studies entrepreneurship and economic development – with support from SEA Africa (local organisers of the Global Entrepreneurship Congress), South Africa’s entrepreneurs continue to make good strides with entrepreneurial activity. The report was commissioned by the Allan Gray Orbis Foundation and the South African Breweries (SAB) Foundation. These two leading local foundations, which are committed to developing entrepreneurship in South Africa, commissioned the report in order to better understand the role that entrepreneurship is playing in the country. The the intention was also to benchmark South Africa globally, celebrate achievements and strengths, and to assess areas for improvement so as to know how best to guide resources and policy in the coming years. The report states that entrepreneurs in South Africa have overcome structural factors, including the country’s slow GDP growth rate and the number of large firms dominating the business market to produce some of the most successful enterprises on the continent. 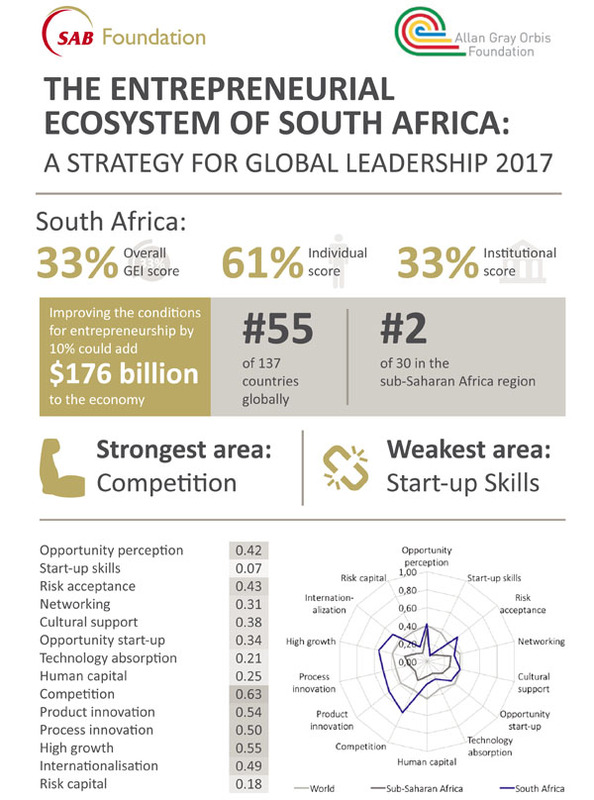 The country is poised to achieve further growth in years to come through entrepreneurship and indicates that South Africa is on par with other middle income countries around the world when it comes to entrepreneurship, and provides the institutional support necessary for high-growth businesses to startup and thrive. South Africa was ranked 55 out of the 137 countries surveyed globally. The ranking places Botswana in first place from Africa, followed by South Africa, Namibia, Gabon and Ghana. The GEDI report covered 28 countries in the Africa region, which amounted to 54 percent in total. The report demonstrates the country’s position globally when it comes to new businesses, competitor position, new businesses offering new products and new businesses using new technology, and ranked the country in the top 25 percent of countries surveyed globally in these areas. But stumbling blocks exists, and factors such as finance, skills, access to local and international markets, education and the right network need to be addressed to ensure that South African entrepreneurs are able to grow and thrive. Note to Editor: The Allan Gray Orbis Foundation believes that entrepreneurially-minded individuals with ethical values and strong leadership skills hold the promise of change. We stand behind entrepreneurs improving the socio-economic landscape of Southern Africa. Our mission is to foster such impact by providing youth demonstrating the highest potential access to education and cultivating within them an entrepreneurial mindset. The Allan Gray Orbis Foundation is the social responsibility initiative of Allan Gray Limited and the Orbis Groups in South Africa. The SAB Foundation was set up in 2010 as one element of the broad-based black economic empowerment transaction conducted by South African Breweries Ltd (SAB). The SAB Foundation is an independent Trust that annually invests millions of rands towards developing entrepreneurship in South Africa and the benefit of the wider South African community. The foundation focuses on the provision of funding for small, medium and micro-sized enterprises, in order to contribute to the economic and social empowerment of historically disadvantaged persons, primarily (but not necessarily exclusively) by means of Entrepreneurship Development and with a priority focus on providing opportunities within small, medium and micro-sized enterprises for women and youth in the rural areas, as well as persons with disability.